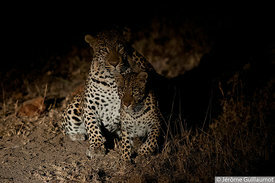 The Leopard is an elusive animal, maybe the most difficult « big five » species to check in the wild during a photo safari. It is a magnificent animal and each spotting is a great moment for the photographer. But on this day of July 2012 the encounter was really exceptional : we were not facing 1 lonely Leopard, as it is the case for most of Leopard spotting – considering it is a solitary animal – but 2 individuals heckling in the bush. 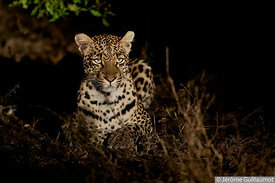 It was during a stay in the Sabi Sand Private reserve in South Africa, in the area of Nkorho. This zone, constituted of a group of private reserves, south west from Kruger National Park, is certainly the best place in Africa to spot Leopards. It was late in the afternoon and light was dim. 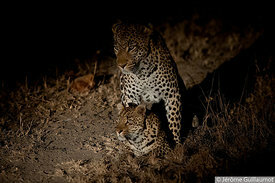 The spotting was very lucky because the 2 Leopards were hidden in the bush. At the beginning we heard them more than we saw them. Nonetheless, the growls were with no doubt due to a pair starting a long love night. Watching Leopard while mating is a very unique opportunity and even if the conditions were not that good for photography I realized how lucky I was to spot such a behavior. At the end of mating, the female turned violently to push back the male in a huge roar. That was it ! It lasted less than 10 seconds. I was still under chock when, after only a 3 minute break, the female went back to the male in a sensual and provocative display. And, of course, the male didn’t resist and mating started again. And that was not the last one. In the following hour, they did it 10 times, that means one mating every 6 minutes ! Each time it is the same process. The 2 Leopards are lying a few meters from each other when the female stands up and comes toward the male, gently rubs her side by its male’s then lies down in front of him. The male then stands up and copulate with the female. During mating the male bites the female’s nape and we can hear a continuous low growl from both animals. All this lasts less than 10 seconds then the female chases the male again in a thundering roar. Sometimes, the female lies down and rolls on its back, apparently a process to help fertilization. Photo conditions were poor : bushes, diming light and soon dark night… Fortunately, after several matings half hidden by branches and herbs, the pair moved to an open area. Visibility was much better and then I realized the huge size gap between both animals. Generally speaking female is 2/3 of the male size. Here, specially if we consider head size, the female appears like a juvenile as compared to this adult male. Eventually, after one hour, the pair went back to thick bushes and disappeared in the night.